From Appalachia to Louisiana and beyond, rural string band music in the 1920s did not fit into a single, simple category. Here are three examples of vastly different styles that share only two things in common: the use of nothing but stringed instruments, and incredible musicianship. 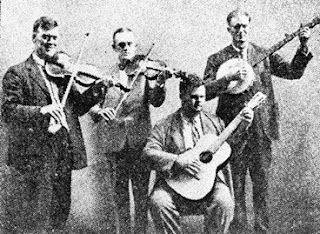 Whereas the Appalachian string band style steered towards fast, dance-oriented songs, the country music made further west tended to be slower in pace and more mellow in tone. This band, featuring several members and associates of the Taylor and Grigg families of Arcadia, Louisiana, was exceptionally smooth. Other than the fact that the instruments all had strings, it almost doesn’t make sense to put them in the same category as other string bands. 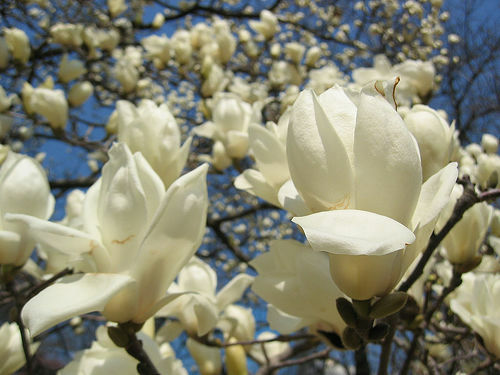 “Where the Sweet Magnolias Bloom” is a fine example of the band’s prowess, a lovely waltz that manages to be sweet as honey without losing its down-home appeal. While fiddler Foster Taylor may take a few liberties with tuning and singer Oscar Logan may have a southern accent, the record is as sweet as anything that was being made for pop audiences. That fiddle is the key to the entire song, by the way. Yes, it flirts with being out of tune, but this merely makes it sound like it is swaying with the dance, and the at times shrill yet always beautiful tone does more to tell the song’s story than the brief vocals ever could. Also magnificent is the warm, rich double bass played by Ausie Grigg. Mississippi natives William Thomas Narmour and Shellie Walton Smith created some of the most captivating string band music of the era. “Carroll County Blues ” may be the greatest example of their unique style. The real star here is Narmour’s fiddle, from which he coaxes as much range of expression as any Delta blues singer from the region. Where a fiddler from Georgia or Kentucky might dazzle with speed, Narmour dazzles with tone, stretching notes out for maximum impact. Smith’s contribution on guitar is much more primal, as he pounds out a steady, unchanging rhythm in an almost percussive way. Smith basically plays the same note over and over, occasionally changing key for a few notes with Narmour, but just as quickly switching back to the same, droning approach. This actually works, though, as Narmour fluidly dances around the beat and occasionally falls in with it, only to magically re-emerge with a fresh perspective. Georgia’s Skillet Lickers was one of the most popular string bands of the 1920s, and listening to this record it is not hard to see why. “Soldier’s Joy” is one of the best-known fiddle tunes of all time. In the Skillet Lickers’ version, the record opens with a brief spoken introduction that ends: “Don’t you let them dance on your new carpet; you make them roll it up.” And at that point, you just know this is going to be an amazing romp. The band consisted of Riley Puckett on guitar and vocals; Clayton McMichen, Gid Tanner and Lowe Stokes on fiddles; and Fate Norris on banjo – and the interplay between them is electric. Bluegrass had not been invented yet, but it’s clear where it found its inspiration. As the guitar and banjo keep rhythm, the fiddles go crazy (especially McMichen’s) in a feverish flurry of activity that covers all the bases. Also worth noting is Puckett’s voice, which is strong and clear enough to rise above the fray, and pleasant to listen to as well.